Guess What Taapsee Pannu Is Passionate About! Jacqueline Fernandez gets more graffiti art! Jacqueline Fernandez fans showcase their love for the actress with more graffiti arts in Bandra, where the sensational beauty resides. After creating a new selfie point in the town with the Graffiti art of 'Jacq of Hearts' near Jacqueline's house in Pali Hill, another graffiti art has emerged near Rizvi college and Carter road in Bandra. The first graffiti art near Pali Hill became a popular selfie point amongst Jacqueline Fernandez's fans giving rise to another art in the vicinity. One of the most loved actresses in Bollywood, Jacqueline Fernandez enjoys immense love from her fans. The actress who was referred to as Jacq of Hearts, recently received a rather special gesture by her fans as they painted a graffiti art near her house. Now, the graffiti art has turned out to be selfie point for her fans as they cannot stop pouring their love on their favourite actress. Bandra is known to have graffiti arts in and around the city showcasing various topics that are close to the city. The latest addition to the art gallery, however, has been an unusual one with fans across quarters leaving no chance to express their love for it. On the occasion of Jacqueline's birthday, her Judwaa 2 co-star Varun Dhawan wished the actress touting her as the Jacq of Hearts and in no time social media was flooded with tweets hailing the actress as Jacq of Hearts. Jacqueline Fernandez enjoys the love and loyalty of her unfathomable fanbase spread across the nooks and corners of the nation. The actress is extremely active on social media and uses the medium to interact with her fans on regular basis. One of the most commercially viable actresses in Bollywood, Jacqueline Fernandez is one of the most sought names in the brand world owing to the blockbuster success of her films. Akshay Kumar is all set for Mission Mangal! Bollywood superstar Akshay Kumar never fails to impress with the characters he plays or the films he chooses to do. Once again the actor is coming with Mission Mangal, which is a joint production Akshay Kumar's production house Cape of Good Films and Fox Star Studios. Recently Akshay's production house Cape of Good Films and Fox Star Studios have signed a three-movie deal and Mission Mangal will be the first film under the joint production. Yesterday Akshay Kumar took to social media and shared the details and also introduced the cast of the film. Mission Mangal has an ensemble cast of Sharman Joshi, Vidya Balan, Taapsee Pannu, Sonakshi Sinha, Kirti Kulhari, and Nithya Menon. While sharing the news Akshay posted a picture of the whole cast and wrote, "Proud and excited to bring the story of India's Mars Mission, #MissionMangal to you. Coincidentally the mission was launched on this very date, 5th Nov. 2013. Meet the team and do share your best wishes for our shubh mangal journey. Shoot begins soon. Mission Mangal will be directed by Jagan Shakti. The shooting of the film is expected to begin this month. After the successful release of a teaser and two official posters, fans were eagerly awaiting the trailer of the Shah Rukh Khan, Katrina Kaif and Anushka Sharma starrer ZERO, which was launched in a spectacular Meeruthiya-style mela on 2nd November at IMAX Wadala in Mumbai. Fans from all around the world thronged to get a glimpse of their favourite stars, and to watch the highly anticipated trailer on the big screen. The fact that the trailer was launched on King Khan's birthday only added to the excitement of its release. The trailer clocked in 54 million views within the first 24 hours, breaking the record for the most viewed Indian film trailer in 24 hours. The numbers continued climbing up on day two, raking in a total of 85 million views in 2 days across all platforms. But as if this wasn't enough, by day 4 the trailer hit 100 million views, breaking records for the highest number of views on any Indian film trailer in less than 96 hours. With such astonishing numbers, the trailer is well on its way to make it to the list of the most-viewed movie trailers of all time! The ZERO trailer is not just the most viewed, but also one of the most loved. Audiences on Facebook made their love for the film evident by grossing a million views and thumbs-ups alike in record time. The accomplishment was repeated on YouTube, making the trailer the fastest to reach a million likes. Here's a quick checklist of some of the records the trailer now holds: -	54 Million Views in 24 hours - Highest for any Indian film -	85 Million Views in 48 hours - Highest for any Indian Film -	Fastest to 1 Million Views on Facebook -	Fastest to 1 Million likes in India -	Highest number of comments on any Indian movie trailer on YouTube -	Highest number of likes on any Indian movie trailer on YouTube -	100M views in 4 days of release - Highest for any Indian movie trailer This feat was made complete with #ZeroTrailer trending worldwide on Twitter. The trailer trended at number 1 on YouTube for days and is also the most viewed and commented Indian film trailer on YouTube. In the trailer, Shah Rukh is seen trying to woo Anushka Sharma, a scientist who moves around in a customised wheelchair. Katrina Kaif, on the other hand, is a ravishing superstar who loves the bottle and Bauua equally, it seems. 'Zero' presents the story of Bauua, a vertically challenged man essayed by Shah Rukh Khan. Set against the backdrop of Meerut, 'Zero' presents a unique as well as rooted story. Bringing back the super hit trio of Shah Rukh Khan, Katrina Kaif and Anushka Sharma, 'Zero' offers interesting performances with an unconventional storyline. Red Chillies Entertainment and Colour Yellow Productions come together to bring ZERO, produced by Gauri Khan, starring Anushka Sharma, Katrina Kaif and Shah Rukh Khan. The Aanand L Rai directorial is all set to release on 21st December 2018. Actor Sanjay Dutt who is currently shooting in Jaipur for his upcoming historical war Drama Panipat, has set up not one but two gyms in Jaipur. 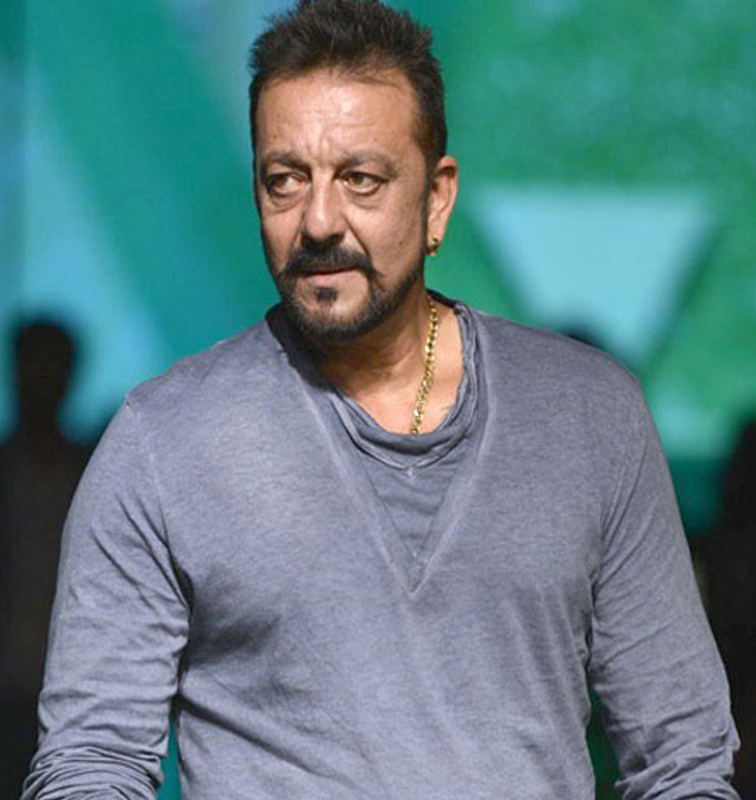 Sanjay Dutt who is leaving no stone unturned by prepping up for his sequences for all his five films, is working really hard to slip into each characters and is also following a strict diet depending upon the role he is portraying. The fitness freak has taken his personal gym equipment from Mumbai all the way to Jaipur where he is been staying for more than one month shooting for Panipat. Not only this, the actor has one more gym at the shoot location which is far away from the Pink City. Since Sanjay Dutt has to maintain a certain Physique the actor works out in between shots and post pack-up depending on the availability of time. Sanjay Dutt who is juggling with more than 5 films this year, is currently having the busiest year. The actor carries his gym along wherever he goes whether it's Karjat or Jaipur and shares his gym with the cast and crew to make it a more enjoyable experience. After the split with Alia Bhatt, Sidharth Malhotra has found the new love. According to recent reports, the actor is said to be in a relationship with Kiara Advani as the couple has been spotted many times hanging out together. It looks like it was none other than Karan Johar who played cupid for the two. Sidharth and Kiara, both have denied to dating each other. But the duo reportedly spends a lot of time together. They are often spotted at the filmmaker, Karan Johar's get together and it looks like that is where the spark between the two started. Siddharth was earlier seeing Alia Bhatt, who is now in a relationship with Ranbir Kapoor. On the work front, Sidharth will be seen next in the film Jabriya Jodi opposite Parineeti Chopra. Salman Khan exploring new horizons! 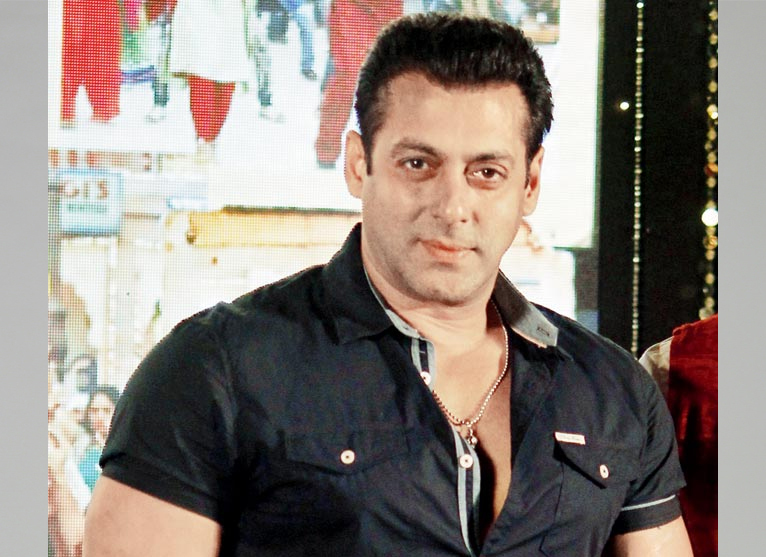 Salman Khan's talent company Uniworld Being Talented takes strategic ownership in Kwan's holding company Salman Khan's talent company UBT picks up strategic stake in Big Bang Media Ventures the holding company that owns premiere talent company Kwan. The same company also owns Mantena Film Ventures, which has business related to film production, distribution, televsion production, music production, licensing as well as a new music label for independent artistes. The strategic merger is of utmost benefit to both the parties, with the collaboration providing an edge to the operations of both the companies. With this development, Kwan entertainment gains rights and access to UBT's talent roaster including Salman Khan while the superstar's company owns access to their talent and the entire infrastructure and services of Kwan entertainment and its affiliates including KWAN South. Speaking about the development, Vikram Tanwar, co-founder of UBT says, `We are excited about this partnership and look forward to creating great synergy between the two companies.` Producer Madhu Mantena adds, `We are delighted with the opportunity to partner UBT and look forward to building large, sustainable and transparent entertainment services.` This one of a kind association between a Bollywood superstar with a premium talent agency Kwan entertainment is one of the biggest alliances of the industry this year. Actor Rana Daggubati has started shooting for the upcoming Bollywood laugh riot 'Housefull 4'. Rana took to his official Twitter handle and shared the news with his fans, writing, "Heading to the sets of Housefull 4. Shooting in Mumbai after a very long time!!" Daggubati was not a part of the cast earlier, this development comes weeks after Nana Patekar decided to step out of the project after facing sexual harassment allegations by Tanushree Dutta. The multi-starrer comedy features Akshay Kumar, Riteish Deshmukh, Bobby Deol, Kriti Sanon, Kriti Kharbanda and Pooja Hegde in the lead roles. It also stars Chunky Pandey, Johnny Lever, and Boman Irani. Based on the theme of reincarnation, the fourth film of the 'Housefull' series is slated to hit the big screens on Diwali 2019. It's being directed by Farhad Samji. 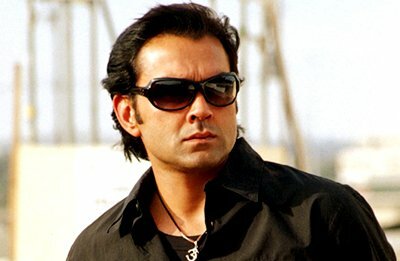 Farhad replaced Sajid Khan who stepped down following allegations of sexual harassment. Did Priyanka Chopra, Nick Jonas obtain marriage license? Seems like, Priyanka Chopra and Nick Jonas are one step closer to tying the knot. According to media reports, the couple recently obtained a marriage license in the United States (US). Priyanka and Nick stopped by the Beverly Hills courthouse last week to fill out the necessary paperwork. In August, Priyanka and Nick confirmed their engagement during a trip to Mumbai, where their families gathered for festivities, including a Roka ceremony and a big engagement celebration. Priyanka's bridesmaids Mubina Rattonsey and Anjula Achari recently hosted a bridal shower for her at Tiffany's Blue Box Cafe in New York City. It was attended by all her family members and close friends and the actor looked all excited and happy during the bash. Last week, the bride-to-be was joined by her cousin Parineeti Chopra and her future sister-in-law and 'Game of Thrones' actor Sophie Turner, among others, as they headed to Amsterdam to enjoy Priyanka's final days as a bachelorette. Reportedly, Priyanka Chopra and Nick Jonas will get married in Jodhpur in December. Hugh Jackman inspires us with his performances. Said to be mounted on a budget of Rs 200 crore, Zero finds pride of place in Shah Rukh Khan's filmography as his most expensive film to date. While the mammoth budget would give sleepless nights to most producers, one can count on Khan's astute business skills to ensure that the project does not spell losses for him. 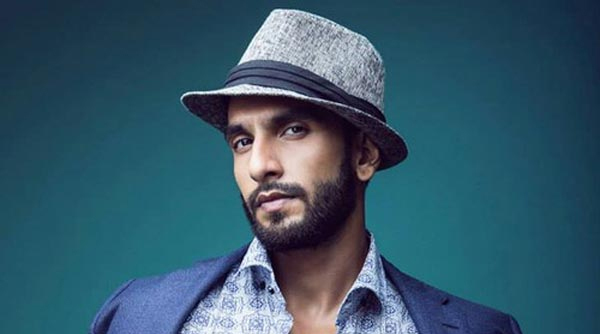 With over two months to go before the Aanand L Rai-directed venture hits screens, trade sources indicate that the superstar has already recovered approximately Rs 130 crore through telecast rights, music rights and in-film branding. A trade source reveals, "The satellite rights have apparently been sold at a whopping sum to Sony Pictures. Plus, Shah Rukh's standing collaboration with Netflix has helped him bag a lucrative deal with the streaming giant for the film's digital rights." 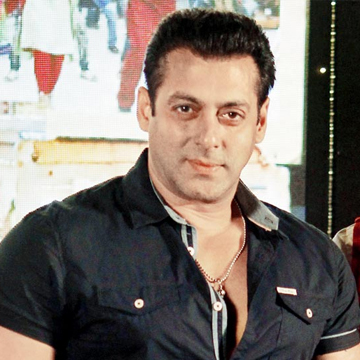 Bollywood star Salman Khan says he has been keen on visiting Arunachal Pradesh for a long time. Salman was interacting with media as he attended a curtain-raiser event for the second edition of an MTB Arunachal Mountain Bicycle Race along with Union Minister of State for Home Kiren Rijiju here. On his love for Arunachal Pradesh, Salman said: “I have never been there, but I don’t know why I like Arunachal Pradesh so much that I just wanted to go there for longest time to see the place and to be there. I did a film called Tubelight with child actor Matin Rey Tangu who hails from Arunachal Pradesh. So, whenever he used to meet me, he used to tell me to visit Itanagar which is in Arunachal Pradesh. “He used to keep on talking about rivers, mountains and the pollution-free environment of Itanagar and Pasighat. So, I got very fascinated with that. He always tells me that ‘Every time you promise me, but you don’t come there. I don’t like Mumbai but then also, I come here to meet you’.” For the event, Salman was dressed in a traditional maroon Monpa jacket from the state. “I tried to go there many times, but this time I hope I can make to this event. 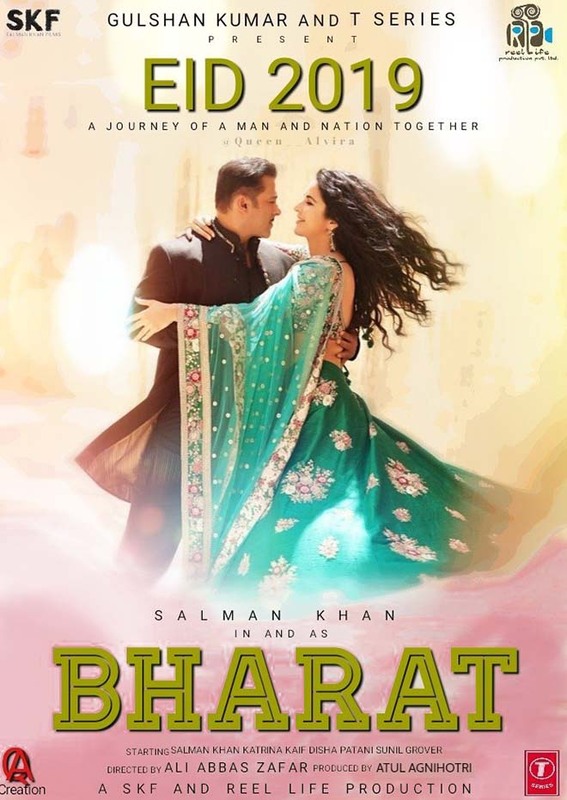 That time (when the event takes place), I am shooting for ‘Bharat’ in Delhi. So, if I get one day off from the shoot, the first thing I want to do is to be a part of this event.” He lauded the trailer of Thugs Of Hindostan, which features Aamir Khan, Amitabh Bachchan, Katrina Kaif and Fatima Sana Shaikh. “It is outstanding,” he said. In one of her first acts as a startup investor, actress Priyanka Chopra recently toured the San Francisco home of her new portfolio company, a coding education company called Holberton School. The campus resembles a WeWork more than a school, with open-plan rows of desks, decorative neon lights and meeting rooms named after famous people. The school uses projects and group learning instead of more traditional courses, to teach software development. “You just hang out and you’re learning,” Chopra said. “It’s amazing.” Chopra, 36, has been doing a lot of hanging out and learning in technology circles lately. In between presenting at the Emmys, sitting in the front row at New York Fashion Week, celebrating the birthday of her fiancé, Nick Jonas, in Texas, and darting to her native India to act in a movie, she has squeezed in meetings with startup founders and lined up future investments. “Geeks are taking over the world,” Chopra said. “If they haven’t already,” she quickly added. There’s no shortage of celebrities investing in tech startups. So far, deals from male actors, athletes and musical artists have garnered much more attention than those from famous women. Ashton Kutcher is a regular at tech conferences; Carmelo Anthony and Nas have their own funds; Leonardo DiCaprio has been an adviser to at least three venture firms. Tyra Banks, Beyoncé and Demi Lovato have participated in startup deals. But few women have built robust portfolios. Chopra said she did not yet know how many deals she will do or how much money she would invest, but she does plan on building a portfolio. On Wednesday she announced her second investment, in Bumble, a dating and social media app founded by Whitney Wolfe Herd, one of the most prominent startup founders in tech.Chopra plans to help promote Bumble’s launch in India in the coming months. Chopra was introduced to tech investing by her manager, Anjula Acharia, a founder and angel investor who spent time as an entrepreneur-in-residence and partner at Trinity Ventures, a Silicon Valley venture capital firm. Acharia has worked with Chopra since 2010. Acharia was the first investor in ClassPass, a fitness booking startup; she made a return on the company’s most recent round of funding. She’s also invested in Bulletproof Coffee, Health-Ade Kombucha and The Muse. She said Jimmy Iovine, a mentor who backed her entertainment startup, DesiHits, taught her how to anticipate cultural trends. Acharia has straddled Hollywood and Silicon Valley says that, as an Indian woman, she has been a rarity in both worlds. On weekends, at the Hollywood parties she has frequented with Chopra, Acharia noticed they were often the only South Asians in attendance. Then, on weekday meetings with entrepreneurs and partners at Trinity Ventures, she was often the only woman. “I was always a minority,” she said. With Holberton involvement, Acharia and Chopra are making an effort to help change the tech industry’s gender disparity. After the musical performer Ne-Yo invested in Holberton and began to promote the school to his fans, applications from underrepresented minorities increased. Now, two thirds of Holberton’s students are people of color, and 30 percent are women. Chopra plans to promote the school to her fans as well. “If one day, because of Priyanka, it became 100 percent women, I’d be cool with that,” Acharia said. Founded in 2015, Holberton teaches students to code for free, then charges 17 percent of their paycheck for 3 1/2 years after they graduate. All of its graduates have found jobs. Chopra’s investment is part of an $8.2 million round of funding for Holberton which closed in April. She will join the company’s board of advisers. Chopra emphasized her support for Holberton’s mission to educate people from underprivileged backgrounds. Her investments will skew heavily toward companies with an element of social impact, and companies founded by women. “I don’t want to just be one of those people who’s like, ‘Yeah, I want to be on the tech bandwagon — how are they making so much money,’” she said, surveying the Holberton workspace in a cream pantsuit and snakeskin stilettos. “It’s not about that.” Chopra has worked with UNICEF to advocate for children since 2006, focused mostly on developing nations. But a dinner conversation with Acharia around the time of the 2016 election turned to education in America. That led Acharia to introduce Chopra to the Holberton School’s founders. “I think Holberton was the gateway drug for Priyanka,” Acharia said. Despite the swirling wedding rumours, Deepika Padukone and Ranveer Singh have not yet admitted to their relationship. Though they are said to wed in November, there is no announcement. On Friday, the two were asked about their wedding at an event in New Delhi. 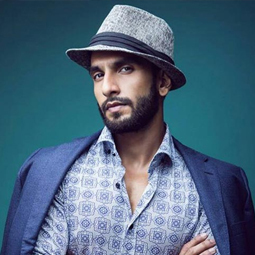 Ranveer quipped that they would tell the world when it happens. Fans were quick to point out that since they are not denying the nuptials means it is happening. Dippy also revealed at the event that when she first met Ranveer, she felt he was not her type. Talk about opposites attracting each other. Director Krish Jagarlamudi walked out of the Kangana Ranaut-starrer Manikarnika: The Queen Of Jhansi mid-way to helm the NTR biopic. It appears that he is now hell-bent on releasing the film ahead of Manikarnika, which has Kangy stepping into his shoes to complete the project. The makers of the two-part Telugu film, on the life of a legendary star and former Andhra Pradesh Chief Minister Nandamuri Taraka Rama Rao, announced that its first part will release on January 9 and the second on January 24. Manikarnika hits the marquee on January 25. This means that Krish has three films releasing in the same month. Ironically, the release date was announced just two days after the teaser of Manikarnika was out. The battle lines have been drawn. Manikarnika: The Queen of Jhansi is an Indian epic biographical film based on the life of Rani Laxmibai of Jhansi. Produced by Zee Studios in association with Kamal Jain & Nishant Pitti, the film is slated to release on January 25, 2019. Kangana Ranaut plays the titular role of Rani Laxmibai. Principal photography on the film began in May 2017. Loveyatri Story:: Sushrut’s (Aayush Sharma) only passion in life is to teach garba to kids in Vadodara, but this time, the 9-day Navratri festival changes his life. He falls head over heels in love Michelle (Warina Hussain) and does everything he can to win her over. Sushrut or ‘Susu’ as he’s fondly called, is written off as an unambitious boy, whose only interest is to dance his life away. He constantly faces pressure from his family to find a ‘real’ job, while he dreams of opening his own garba academy in Vadodara. Over to the United Kingdom; Michelle is at the top of her class, but she wishes to return to her motherland in India. Her father (Ronit Roy) reluctantly agrees; they arrive in Baroda and extend their stay to celebrate Navratri on the insistence of his imposing Gujarati family. During the ‘festival of dance’, Susu falls in love with Michelle at first sight. He becomes the typical lover boy who literally runs in circles, to follow his heart. ‘LoveYatri’ is a straightforward love story – nothing more, nothing less. The makers clearly set out to create a sugary film, so they do that with enthusiasm and tons of nostalgic appeal. Debutant director Abhiraj Minawala plays it safe by sticking to a tried and tested formula, focusing on mushy moments to create drama. The problem is that there are too many sweet nothings in between, and that doesn’t help an unambitious screenplay. The characters are likeable, but the story doesn’t make you feel for them because there is little conflict of note and whatever arises is doused with ease. The songs in the film get special attention for capturing the festivity and mood around garba. Composer Tanishk Bagchi’s renditions of ‘Chogada’ and ‘Dholida’ are energetic with foot-tapping energy guaranteed to be popular on every Navratri playlist. Vaibhavi Merchant’s choreography will inspire plenty to shake a leg as well. The rest of the compositions are catchy enough not to become overbearing as they emerge at the drop of a hat. It’s evident that Aayush and Warina are raw, but both have a charming screen presence with enough chemistry. Since the story requires them to be innocent and naïve young lovers, this inexperience works in their favour. Ayush’s boyish appeal is likeable, although his first film doesn’t give him a chance to show much range as an actor. Ronit Roy as Michelle’s father and Ram Kapoor as Susu’s uncle, lead the charge to handle the emotionally heavier dialogues and scenes. Although ‘LoveYatri’ lacks the gripping appeal of more contemporary romantic stories, it might be just enough to satiate die-hard romantics looking to revisit the love stories of the 90s. REVIEW: Sriram Raghavan is known for his knack of dishing out twisty neo-noir, and he lives up to his reputation with AndhaDhun — a dangerously wicked thriller with dollops of dark comedy. Very few filmmakers manage to crack this genre and Sriram is adept at it. His film smartly questions your faith in ‘seeing is believing’. Honestly, blind protagonists make for scrumptious thrillers and Raghavan ensures he doesn’t miss a beat either. 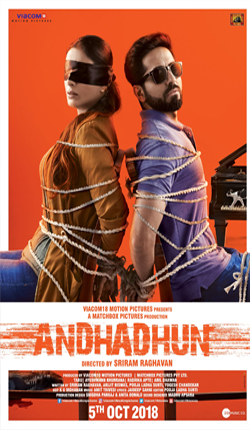 Inspired by a French short film L'Accordeur or The Piano Tuner (2010) by Olivier Treiner, AndhaDhun is a nerve-racking tale of fear, deceit and crime, that keeps you on the edge of your seat as it teases your mind. A ‘Scream’ (Hollywood slasher) scene in particular, acts as a classic jump scare. Boasting of a brilliant screenplay and masterfully crafted narrative by Raghavan, the story’s audacious characters and constant twists, keep you riveted. Atmospheric and moody, an underlying fear of what lies ahead grips your imagination. While the first half is replete with a blend of palpitating tension, suspense and comedy in classic Raghavan style, the second half slumps a bit. The plot gets a tad chaotic and convoluted as opposed to its terrific build-up. The long-winded conversation between characters slackens the pace and eases out the tension a bit, which you don’t expect at that point. However, a spectacular climax makes up for it. Ayushmann Khurrana in the lead role is a revelation. While he lends that effortless ease to every role he portrays, AndaDhun is the most definitive role of his career so far, that proves his versatility. Tabu is outstanding as always in a conflicted role that expects her to be erratic, vulnerable and deceitful. Sairat (Marathi blockbuster) actress Chaya Kadam and Ashwini Kalsekar leave an impact. Yesteryear actor Anil Dhawan makes a memorable appearance and Amit Trivedi’s music gives an haunting edge to the film. The interesting background score adds as a perfect layer to the ongoing proceedings. Open to various interpretations and unpredictable from beginning to end, AndhaDhun is an engaging thriller that keeps you on your toes and leaves you guessing all the way. REVIEW: Pataakha is the story of sisters who love to hate each other. This isn't your average sibling rivalry; this is passionate and spiteful hatred for your kin. The sisters literally want to strangle and choke the life out of each other. This strange sibling relationship forms the crux of Vishal Bhardwaj’s film, where the Rajasthani language and the rustic setting present a side of Rajasthan that you haven’t seen before. But for all its novelty, Pataakha is a film that’s a bit too hard to take in. Grasping the strong Rajasthani dialogues might prove to be a challenge for the average viewer. For 2 hours and 15 minutes, the sole focus of the screenplay stays on the fact that the sisters can’t live without getting into a brawl and while the uniqueness of the story is admirable, after a point, it does get a tad monotonous. Badki and Chhutki’s bickering and battles become spectacles for local crowds as their wily neighbour, Dipper, never misses a chance to instigate a war between the two sisters. Vishal Bhardwaj’s Pataakha, comes from an original short story by writer Charan Singh Pathik, and the sheer audacity of the sisters’ relationship, makes this idea interesting. 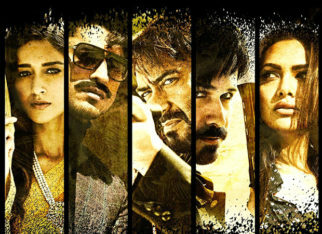 As a viewer, the most pertinent question that you feel while watching Pataakha is ‘why do the sisters fight so much?’ At some point in the film, the father (Vijay Raaz) poses the same question to Dipper, who explains that it’s just like the one between India and Pakistan, where the sisters and the countries cannot survive without conflict and combat. Vishal Bhardwaj has set the film in Rajasthan and the sights and sounds are nothing like the usual, castle-heavy landscapes of Jaipur and Udaipur, which the audience has seen before. While he’s kept the story realistic to an extent that the characters speak only in the local language, which also becomes one of the biggest problems for the audience. You will often find yourself grappling to comprehend the dialogues. Perhaps, more lines in Hindi would have made it easier for the audience to connect with Pataakha’s excellent physical and situational humour. The performances by Radhika Madan and Sanya Malhotra are top-notch to say the least. Both actresses have dug deep into their earthy characters and their feisty and animated performances are worthy of applause. During the second half, the actresses put on weight too, and their physical transformations are impressive. The two sisters are nothing short of firebrands. Vijay Raaz, Sunil Grover and Saanand Verma are equally adept with their comic timing. Vishal Bhardwaj, as he always does with his films, has tried to put many quirky spins into this comedy. The music is rustic, but very pleasing. He has also provided an interesting background score. During the second half, as the film briefly explores a psychological reason for the sisters’ tendency to fight, the sci-fi sounding background music adds a delightful touch to the proceedings. But for all its wonderful and creative touches, Pataakha still feels like a story that stretches a short concept, for a little too long. 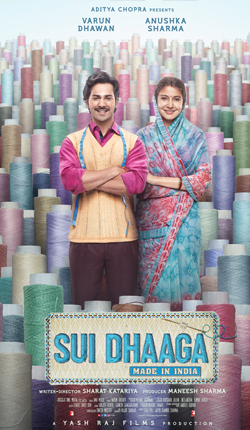 Sui Dhaaga Story:Egged by his wife Mamta (Anushka Sharma), Mauji (Varun Dhawan) decides to ditch his demanding bosses for his own tailoring business. But amidst naysayers, unscrupulous relatives and lack of support, will his dream of turning into an entrepreneur become a reality? REVIEW: “Sab badhiya hai,” is Mauji’s response to daily struggles for a mediocre existence. In them, is a commute-heavy job, bosses who use him for personal errands and entertainment, a resentful father, an ailing mother and a marriage sans romance. His wife has no time for love between household chores. Following a very realistic confrontational scene with his bosses, Mauji quits to start something of his own. Sui Dhaaga is full of such simple daily conflicts and solutions that are seamlessly woven into the narrative. The film revolves around a handful of characters. While Varun Dhawan delivers an honest performance, almost never going overboard, Anushka Sharma’s restrain is effortless. She lives the character, clad in a simple sari, sporting sindoor and minimal make up. Together their romance is understated to the point of being non-existent, but that doesn’t take away from their partnership as a couple while fighting the odds in life. Among the supporting cast, Raghubir Yadav is spot on as a cynical father, taunting his son with sarcastic one-liners that will often make you chuckle. But the actor to watch out for is Yamini Dass, who plays Mauji’s mother. She justifies every moment of her screen-time. She is adorable even when she’s doling out daily chores to her bahu from the hospital bed. Director Sharat Katariya does take a few cinematic liberties, but there are enough real moments to move you. In a winning first half, he successfully establishes his main characters and their problems. Smart usage of humour in dialogues ups the entertainment quotient, even when the going gets tough for the characters. Film’s songs and background score lend gravitas to the story. While the narrative doesn’t get too preachy or predictable, the second half is simply convenient. Also, while Mauji’s struggle for self-employment finds ample mention, there isn’t much to justify his excellence in the craft, except his failed legacy. However, these are minor patches in the overall fabric of the film that is cut for entertainment. Sui Dhaaga is sewn together with strong performances and moments that tell a convincing story. 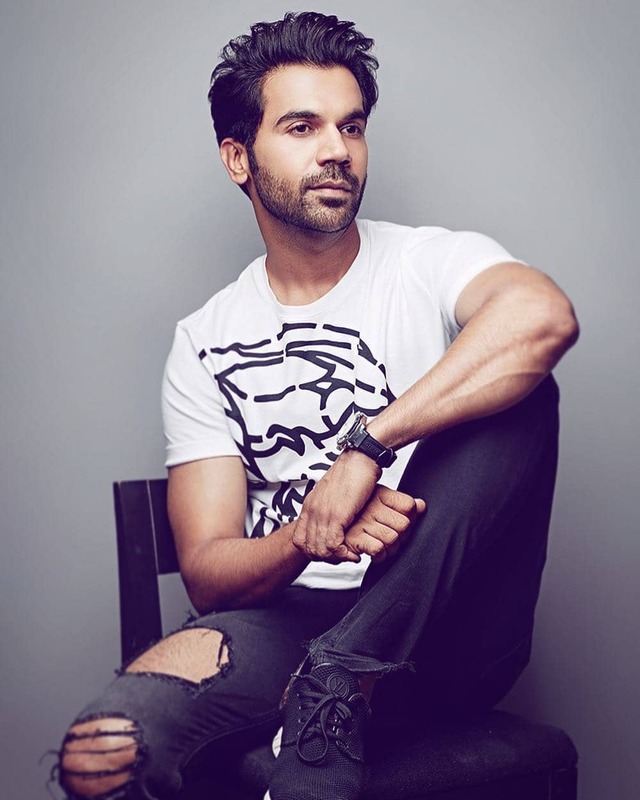 Several of his friends and filmi folks, who haven't seen him on the big screen in four years, have been congratulating him for attempting to play a teacher who speaks shudh Hindi, a tribute to his father Dharmendra's character in 'Chupke Chupke'. Now that the film, which centres around vasectomy, is all set to hit the screens, the actor will start looking at the other projects he has been offered. For Bobby, his dad has always been a huge inspiration. He says, "I am hungry for work. I want to collaborate with good directors on interesting scripts. I am happy that Poster Boys has got me back on everyone's minds. I am looking forward to new subjects and roles." The upcoming comedy, the remake of a Marathi film of the same name, also features macho Sunny Deol as one of the victims of a campaign that promotes vasectomy. 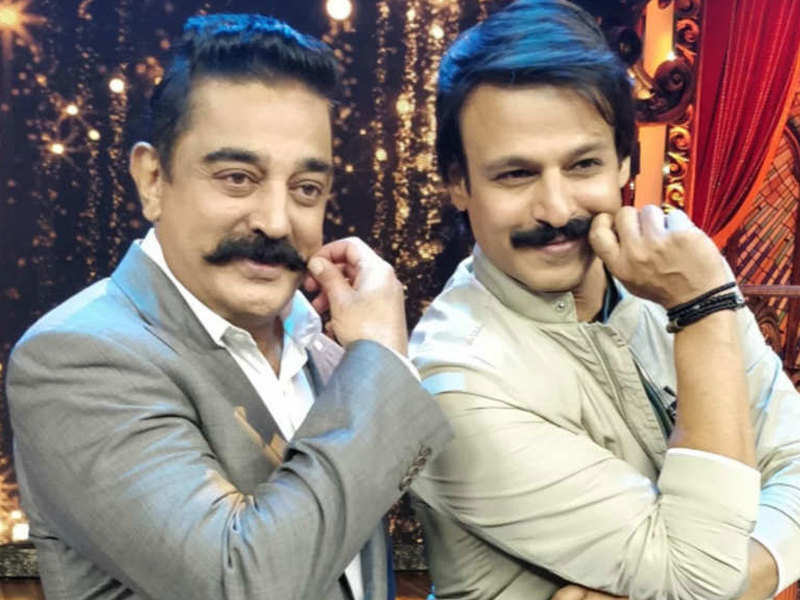 The reason an actor with a repertoire of action films agreed to be a part of this light-hearted project is that today, meritorious content seems to have outshined big-budget projects. 'Poster Boys', produced by Sony Pictures Networks Productions, Sunny Sounds Pvt Ltd, Shreyas and Deepti Talpade, releases on September 8.